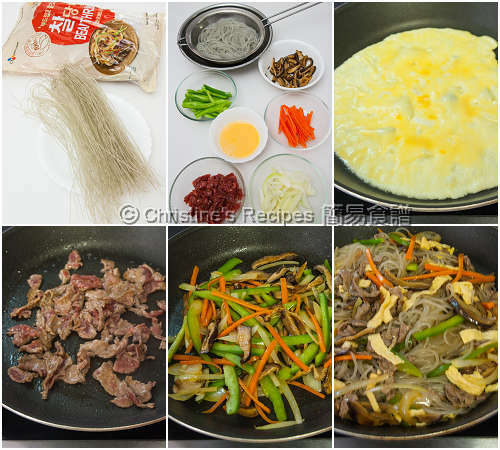 I always feel making this traditional Korean noodle dish a bit similar to our Hong kong stir-fried noodles. 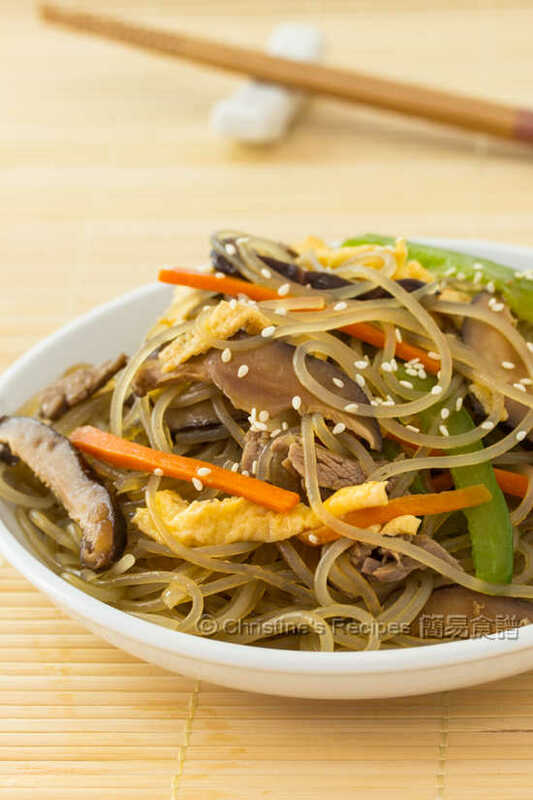 Korean noodles are made from sweet potato starch. 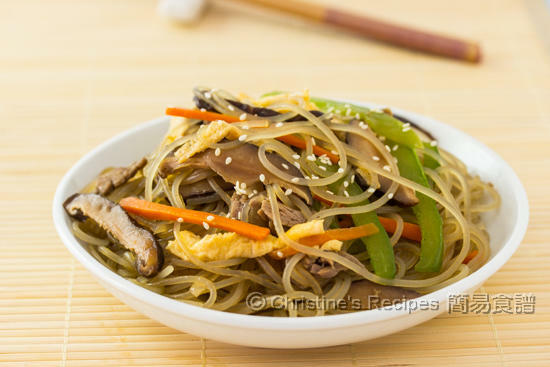 You can toss the cooked noodles with any vegetables you like. It’s a light and healthy dish suitable for any seasons throughout the year. Cook the noodles in boiling water for 5 to 6 minutes. They will turn soft and almost transparent when cooked. Rinse in cold water and drain well. Use scissors to cut them a few times. Mix well with light soy sauce and sesame oil. Set aside. Heat oil in a non-stick fry pan over medium heat. Fry whisked egg as omelette. Remove from pan, then cut into strips. Set aside. Saute the beef until almost cooked. Transfer to a plate. Add some more oil to sauté garlic until aromatic. Add carrot, capsicum and cook until soft. Toss back the noodles and heat evenly. Add the egg strips. Pour in the sauce. Stir to combine. Dish up. Sprinkle some sesame seeds on top. Serve immediately. I used skirt beef, sliced thinly. It’s good for stir fry. You might like to adjust the amount of light soy sauce to your liking. If you’re into hot noodles, you might add some Korean chilli sauce. It must have been a century since I last had some sweet potato noodles. This looks very tasty, Christine.